The South Eastern Freeway forms part of the Adelaide to Melbourne road corridor and is an important strategic freight route for South Australia. In 2018, the South Eastern Freeway carried an average of 50,000 vehicles per day, with approximately 4,400 of these classed as heavy vehicles. A maximum 60km/h speed limit applies to all trucks and buses from the Crafers interchange to the bottom of the freeway. The speed limit for all other vehicles is 90km/h and drivers should remember to always drive according to the prevailing road conditions. 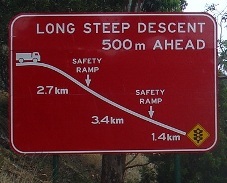 All road users are reminded and particularly heavy vehicle drivers that the last 7kms of the South Eastern Freeway comprises a very long and steep descent that, although the gradient becomes less severe near the bottom of the Freeway, it does continue downhill through a signalised intersection and into an urban area. From 1 May 2019, changes to legislation will introduce new penalties for drivers of all trucks and buses who are detected driving unsafely on the down-track of the South Eastern Freeway into Adelaide. The amendments to the Road Traffic Act 1961, Motor Vehicles Act 1959 and supporting regulations aim to improve road safety on the South Eastern Freeway and reduce heavy vehicle crashes involving brake failure and excessive speed. The amendments implement recommendations from a Coronial Inquest following two serious crashes in 2010 and 2014 involving out-of-control heavy vehicles that tragically resulted in loss of lives and serious injuries. Not drive at a speed in excess of the relevant speed limit. Note: Trucks and buses are limited to a maximum speed of 60km/h on the South Eastern Freeway down-track, however speeds may be further reduced via the variable speed limit signs or other temporary speed limit signs at any time as required to maintain safe travel. This may include inclement weather, reduced visibility or as a result of a crash, roadworks etc. These new penalties only apply to the portion of the down-track of the South Eastern Freeway as indicated on the map below, ending at the intersection of Portrush, Cross and Glen Osmond Roads. Existing speeding penalties continue to apply to trucks and buses that exceed the relevant speed limit by less than 10km/h on this stretch of road after 1 May 2019. Please note; in the event of an emergency, exemptions apply to emergency vehicles in relation to the offences of using low gear and exceeding the relevant speed limit on the SE Freeway descent. Emergency vehicles are expected to use flashing red or blue lights or sirens and take reasonable care when driving in an emergency. The new penalties will also see a substantial increase in the body corporate levy which will apply to businesses who fail to nominate the driver responsible for a camera-detected speeding offence on the South Eastern Freeway down-track. A body corporate that successfully nominates a responsible driver will not incur the body corporate levy. Do these new laws apply to me? All vehicles classed as a truck or bus will be subject to the new laws on the South Eastern Freeway down-track from 1 May 2019. 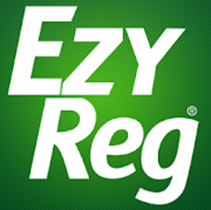 While some vehicles are clearly a truck such as semi-trailers and B-double freight trucks, there are a number of smaller vehicles that may also be classed as a truck or bus based on GVM or seating capacity. These advisory signs, as well as speed limit and low gear signs that refer to “Trucks & Buses” apply to drivers of all vehicles mentioned above. For a safe descent - use the right gear. A new offence modelled on existing Australian Road Rule (ARR) 108 will apply to the last 7km descent of the South Eastern Freeway from 1 May 2019; however the intent remains the same. All city-bound trucks and buses must slow down and engage the appropriate low gear to descend safely. Heavy vehicles are able to overtake on the descent, as long as they remain in low gear and do not exceed 60km/h. However they are required to stay in the left lane between Crafers and the Measdays bridge exit ramp and therefore cannot overtake between these points. Increased penalties will apply from 1 May 2019 for failing to use low gear on the down-track of the South Eastern Freeway. 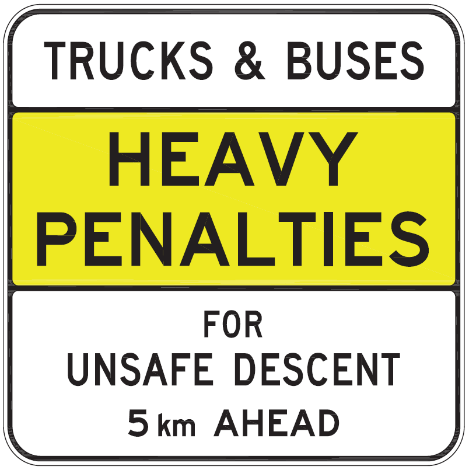 ARR 108 (and associated penalties) will continue to apply on all other descents across South Australia where “Trucks and Buses must use low gear” sign applies. There are two fully signed safety ramps on the left side of the South Eastern Freeway between Crafers and Adelaide. The first is located prior to the entrance to the Heysen Tunnels and the second is three kilometres further down just past the Mt Osmond Interchange. The main stopping force in a safety ramp is the drag caused as the vehicle sinks gently into a bed of gravel. The effect on the driver is actually less than emergency braking, so the stopping force of the gravel should not result in injury to the driver and it is unlikely to cause damage to the vehicle. 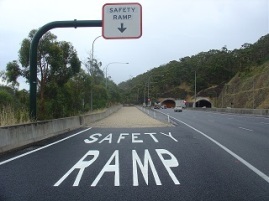 The signing for the safety ramp comprises approach advisory signs and clear pavement markings in the safety ramp entrances to indicate which lane to use. The safety ramp signs display the distance to the safety ramp at 600m, 500m 400m 300m 200m and 100m respectively, with the 600m sign showing a symbolic representation of the safety ramp. The safety ramp signs for the second safety ramp display LAST CHANCE on the 300m, 200m and 100m signs to indicate the last opportunity to use a safety ramp. Finally, a sign clearly indicates the entrance to the safety ramp. Drivers of heavy vehicles who experience brake failure or related mechanical issues must enter a safety ramp at the earliest opportunity. The removal of a vehicle from a safety ramp requires the use of tow trucks. DPTI must be contacted by using the emergency phone at the safety ramp or by phoning Traffic Management Centre 1800 018 313 direct. The Department of Planning, Transport and Infrastructure operates a number of checking stations to allow a safe off road area for the inspection of heavy vehicles which may be operating illegally or in an unsafe manner. These sites can also be accessed by other agencies such as SA Police, SafeWork SA, Customs and PIRSA. The Monteith Checking Station consists of two stations, situated on either side of the Princess Highway road between Tailem Bend and Murray Bridge and is used to check vehicles travelling into and out of Adelaide. The Monteith weighbridge has a five plate weighbridge capable of weighing large combinations such as B Double trucks in a single weigh. All buses and heavy vehicles with a Gross Vehicle Mass (GVM) greater than 4.5 tonnes must enter the sites when the variable signs indicate all that all trucks and buses must enter. Failing to enter the Checking station when directed and/or disobeying a 'Trucks must enter' sign may result in a fine. 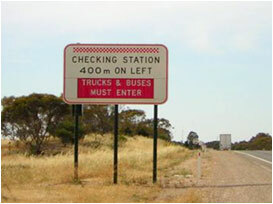 Variable signs (see example) are situated 400 metres before the checking station and just prior to the station to assist drivers to prepare to enter when the checking station is open. All motorists should be aware that the road speed limit will be decreased to 80km/h when the checking station is open and is enforced. The height clearance for the Heysen Tunnels is 5.3 metres (this is also the clearance height for the Mt Osmond and Crafers interchanges). Over-height warning signs are located before both approaches to the Heysen Tunnels and work in conjunction with laser beam vehicle height detectors to detect vehicles that are too high to safely transit the tunnels. When the height detector identifies such as a vehicle, the over-height sign flashes to direct the driver to stop in the stopping lane provided to the left of the road. The over-height detector also automatically sends an alarm to DPTI. Upon confirming the presence of a stopped vehicle via cameras, DPTI will request police or emergency service attendance at the site to assist the driver to turn the vehicle around. Turning around at the entrance to the tunnels has been provided for by a break in the median strip. Drivers may also contact DPTI by using the emergency phones located nearby or use their own phone to call the emergency contact number 1800 018 313. Is connected by the emergency pedestrian cross passages to the other tunnel.